As Spain headed into the unknown, Prime Minister Mariano Rajoy was to chair an emergency cabinet meeting early on Wednesday to discuss the central government’s response. In a speech to regional lawmakers in Barcelona that drew both praise and criticism from separatists, Catalan president Carles Puigdemont said he had accepted “the mandate of the people for Catalonia to become an independent republic” following a banned referendum on 1 October. But the 54-year-old asked the Catalan parliament to “suspend the effects of the independence declaration to initiate dialogue in the coming weeks”. Rajoy has vowed to use everything in his power to prevent independence and has refused to rule out imposing direct rule over the semi-autonomous region – an unprecedented move many fear could lead to unrest. He has called the cabinet meeting for 9:00 AM Wednesday. Political leaders in Catalonia, Spain and Europe have come out against secession, concerned over the country’s biggest upheaval since its transition to democracy in the 1970s. Deputy prime minister Soraya Sáenz de Santamaria told reporters shortly after the signing that Puigdemont was “a person who doesn’t know where he is, where he’s going or with whom he wants to go”. EU nations are watching developments closely amid concern that any Catalan move to break away from Madrid could put further pressure on the bloc still dealing with the fallout from Britain’s shock decision to leave. Reaction was mixed among those who had hoped to witness a historic moment for a region that remains deeply divided over independence. But in Barcelona’s trendy Gracia neighbourhood, resident Maria Rosa Bertran said she was against a delayed secession. “I find it even worse because it is suffering a longer agony, indecision and uncertainty is the worst thing that can happen to us,” she told AFP. EU President Donald Tusk had earlier urged Puigdemont against making a decision that would make “dialogue impossible”. But the Catalan president says the result of the independence referendum that was held in defiance of a Spanish court ban justified splitting from Madrid. Around 90% of the 45% who cast ballots voted for independence but the poll was poorly monitored and many Catalans opposed to secession boycotted what Madrid branded an illegal plebiscite. 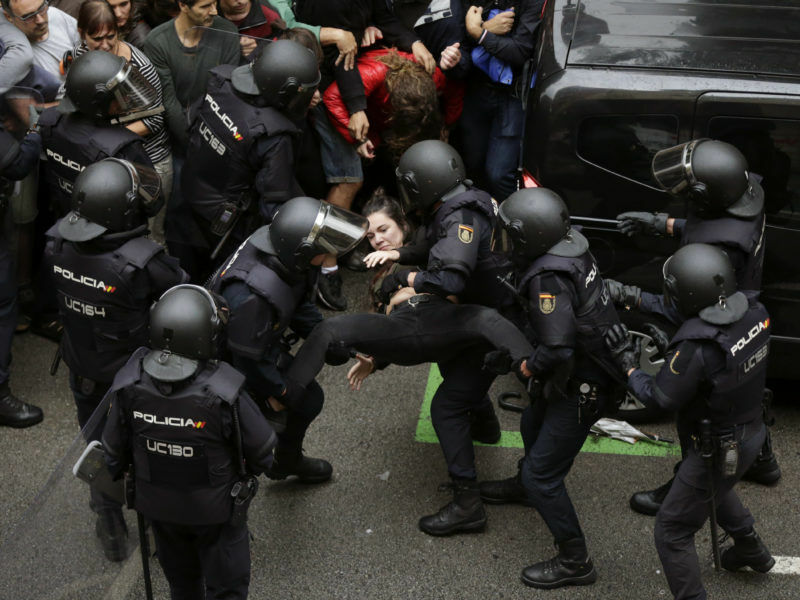 Spain had sought to prevent the referendum from taking place by seizing ballot boxes and arresting a number of organisers, and police used rubber bullets and batons against voters on the day, triggering concern at home and abroad. Puigdemont’s regional government allies, the far-left CUP, lamented a missed opportunity for independence. “We believed that today was the day to solemnly declare a Catalan republic, and we probably missed an opportunity,” said party lawmaker Anna Gabriel. Spain’s stock market shed nearly 1.0% ahead of Tuesday’s parliamentary session and a string of companies have already moved their legal headquarters – but not their employees – from Catalonia to other parts of the country. “The companies have left, the banks are gone, we are all going to see what will happen,” said Barcelona resident Bertran. Publishing house Planeta was the latest to announce a move to Madrid after Puigdemont’s speech. "Catalonia saw the Spanish constitution as a starting point for self-government but the Spanish elites saw it as a final stage"
At the end Catalan leader Carles Puigdemont did not have balls to declare independence of Catalonia. Main question is are really all 7,5 millions of Catalonians for independence of Catalionia or not. It seems that just minority of Catalons (only 2 millions from 7,5 millions ) are supporting independence otherwise if Pulgdemont would have support of 7,5 millions Catalons ready to fight and die for their independence he would declare Catalonian independence. 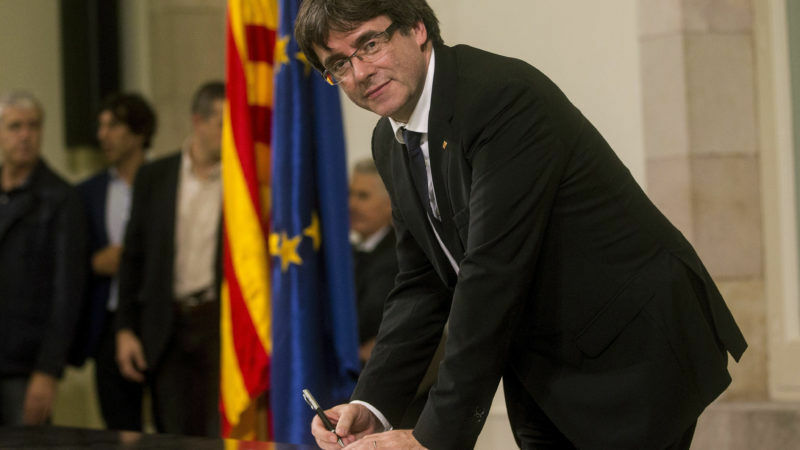 Today Rayoja will arrest Carles Puigdemont and all members of Catalonian parliament who signed yesterday suspended declaration of independence. Those Catalonians politicians showed tthemslef as total dilettantes. Agree but Even if the majority supports there still the approvement from the spanish Governement to change the spanish Constitution allowing such a déclaration . The Généralitat aka Puidgemont has déclared Independent but suspended until now and with that Purgemont intent indirectly to blackmail the spanish Governement . Puidgement is basically doin’ a terrorist move with that . Catalonians Politicians are corrupt outlawers and separatists and some of their Mosso de Esquadra as well . The spanish Army and Authority is on the way . As the EU is having the first coup d’etat since its foundation, what will be the response from the European institutions? Will the EU leave alone Spain again?